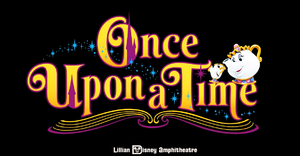 Once Upon a Time was a fireworks show that was presented at the Lillian Disney Amphitheatre in Konawa. Hosted by Mrs. Potts and Chip from Beauty and the Beast, Once Upon a Time is a retelling of Disney stories using music from classic Disney movies as a bedtime story for Chip, the young teacup from Beauty and the Beast. Once Upon a Time was the first full-length show created especially for the MRT server, and was the first show to contain subtitles due to its billingual nature. The show's sponsor was Ilirea Airlines. The original run of the show opened on 9 April 2017 and closed on 28 May 2017. The show is scheduled to be retooled and return in the summer of 2018.